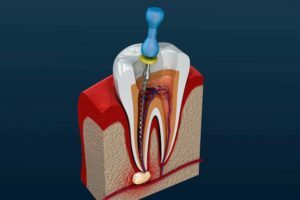 Root canal treatment (also called ‘endodontics’) is needed when the blood or nerve supply of the tooth (called the ‘pulp’) becomes irreversibly damaged due to decay or injury. Sometimes as the tooth dies off it can be extremely painful, conversely the nerve can sometimes die off without causing any symptoms. In some cases the tooth may darken in colour, indicating that the nerve has died. If tooth decay extends into the nerve and the pulp becomes infected, the infection may spread through the root canal system of the tooth. This may eventually lead to an abscess. An abscess is an inflamed area in which pus collects and can cause swelling of the tissues around the tooth. The symptoms of an abscess can range from a dull ache to severe pain, and the tooth may be tender when you bite. If root canal treatment is not done, the infection will spread and the tooth may need to be taken out. No. Usually, a local anaesthetic is used and it should feel no different to having an ordinary filling done. There may be some tenderness afterwards but this should gradually reduce over time.